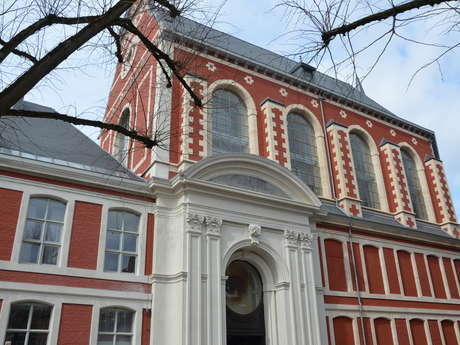 The chapel of the Couvent des Ursulines becomes the home of Mons’ municipal heritage, showcasing the works of art and activities around them. Right at the heart of the Pôle Muséal, Artothèque is a venue dedicated to preserving, researching, restoring and studying our heritage, bringing together all the municipality’s collections in one place! As well as its commitment to conservation, the Artothèque plays also a significant role in the promotion of Mons’ heritage by making it accessible virtually thanks to the virtual Artothèque, as well as by revealing the behind-the-scenes work that goes on in museums. A documentary resource centre right at the heart of Artothèque! The City of Mons’ documentary resource centre is housed in Artothèque, where it occupies some 150m². The documentary references are linked to the municipal collections and Mons’ heritage: history of art, art in Belgium, contemporary art, art in Mons and in Hainaut, artists and artistic trends in museum collections, museology, prehistory, archaeology, architecture in Belgium and in Mons, military history, the history of Mons, folklore... these are all themes covered in the documentary resource centre. It is designed to be a tool that the public can use. For this reason, entry is free, and the electronic catalogue can be accessed onsite or via libraries in the City of Mons’ municipal network.